Antonio Miro Rollerball Pen In Box. Available in: Black. Minimum Quantity: 10. Other Designs Available. Minimum Quantity: 384. Round Paperboard Quiver with Sharpener. Available in Brown. Minimum Quantity: 20. Push Mechanism Featuring Blue Ink Refill & Soft Grooved Rubber Grip Zone. Durable Plastic Pen Holder with Self Adhesive Pad. Supplied Plain Stock Only. Minimum Quantity: 100. Promotional products are an invaluable way to overcome any shortcomings that occurs in spite of the best efforts made by various businesses to promote their brand. Offering your customers a gift is an excellent way to build a long-lasting relation. 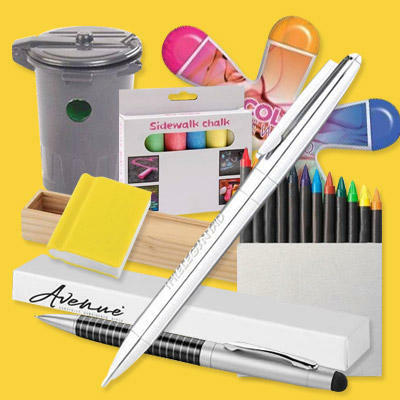 Our promotional gift under this category ranges from roller ball pen with box, pencil toppers, color ball pen, coloring pencil set, multi function stylus pen, banner pen, highlighter pen, etc. All these products can create maximum impact on the brand development of your business. Furthermore, these products can also be used as a driving force for your employees, which will aid in growing your business more and more.